Take note, however, that your dream of a leaner, fitter body may take time, especially if you've stuffed yourself one too many times or if you haven't been physically active in a while. Click here to read on. With Thanksgiving and Christmas right around the corner, it's important to not let your healthy lifestyle go out the window. 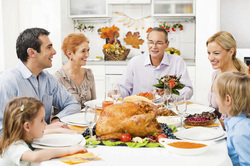 Holiday meals can consist of 3000-4000 calories, enough to gain an extra one to two pounds per meal! What’s the secret to not gaining weight? Experts say increasing exercise and maintaining a regular routine through the months of November and December coupled with intelligent food choices will help you stay ahead of the holiday cheer. For example, eating breakfast and lunch instead of starving yourself before a big holiday meal will help you control your portion sizes. Also consider encouraging your family to take a walk or pick up a game of football in the yard to help you stay active. 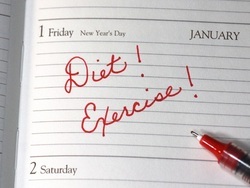 For more holiday fitness tips you can put into action click here. 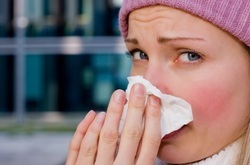 Knowing your family health history is an essential tool to prevent chronic illnesses. What better time to learn about your family than when you are all together?! Surgeon General Boris Lushniak has claimed Thanksgiving as "National Family History Day" and encourages families to discuss diseases and conditions that make up your family health history over holiday gatherings. Doing so may improve and possibly save lives. Shockingly, only a fraction of today's population know their family health history. By writing down family histories, students become more proactive and recognize the link between their families health and their own. To read more about this topic, click here. DURHAM — Mary “May” Segal picked up a cough last week, so she didn’t hit the pool for her usual water aerobics session Monday morning. Nor did she climb onto her beloved “NuStep” exercise machine. 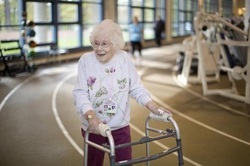 She did, though, manage a slow lap of the tiny indoor track at the Duke Health & Fitness Center, accepting congratulations as she inched along with her walker. It was, after all, a victory lap. And not just because the ever-cheerful Segal reached 100 years old Monday with a sharp mind, relatively good health and enough fitness not only to move around but to exercise three days a week. Regular exercise boosts quality of life and reduces health care costs for people with arthritis, a new study shows. Researchers found that meeting national physical activity guidelines could add up to 20 days of good health in one year for these patients. However, many Americans are not getting the recommended 150 minutes of moderate to vigorous activity a week, in bouts lasting at least 10 minutes each. The findings were scheduled to be presented this week at the American College of Rheumatology annual meeting in San Diego. 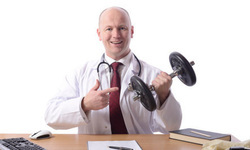 “Regular physical activity improves health and reduces mortality in the general population. 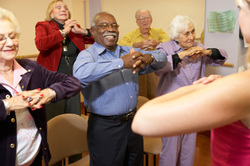 Furthermore, physical activity promotes arthritis-specific health benefits including improving symptoms, function and psychosocial outcomes, as well as reduced disability,” study author Dr. Kai Sun, a medical resident and research trainee at Northwestern Feinberg School of Medicine in Chicago, said in a news release from the American College of Rheumatology. (Health.com) -- If you're feeling under the weather, exercise may be the last thing you feel like doing -- and it's true that when your body's already under a lot of stress, making it do more work isn't always a good idea. But in some cases, light to moderate activity may actually help you feel better, says Dr. Richard Besser, author of "Tell Me the Truth, Doctor: Easy-to-Understand Answers to Your Most Confusing and Critical Health Questions." First, Besser says, use the "neck rule": If your symptoms are above the neck -- sneezing, sinus pressure, stuffy nose -- then breaking a sweat is generally considered safe. Listen to your body, and consider the following best (and worst) workout options. To prepare yourself for when you come down with an illness, click here to find out the best ways to stay active. Considering the high cost of many prescription drugs and the potentially serious health risks, exercise is a superior choice. It has been shown to reduce the risk of colon and breast cancer, depression, the risk of bone fractures, obesity, diabetes, and cardiovascular diseases.